An enzyme is a biological catalyst. A catalyst is a chemical compound that speeds up the rate of some chemical reaction. When that chemical reaction occurs in a living organism, the catalyst is known as an enzyme. The compound present at the beginning of the reaction (starch) is known as the reactant. The compound that is formed as a result of the reaction (sucrose) is known as the product. In most instances, energy has to be supplied to the reactant or reactants in order for a reaction to occur. For example, if you heat a suspension of starch in water, the starch begins to break down to form sucrose. 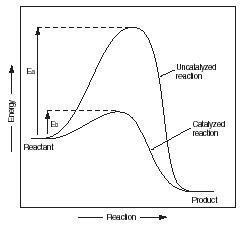 The line labeled "Uncatalyzed reaction" in Figure 1 represents changes in energy that take place in the reaction without a catalyst. Notice that the amount of energy needed to make the reaction happen increases from its beginning point to a maximum point, and then drops to a minimum point. The graph shows that an amount of energy equal to the value E a has to be added to make the reaction happen. The second line in Figure 1 shows energy changes that take place with a catalyst. Energy still has to be added to the reactant to get the reaction started, but the amount of energy is much less. In Figure 1, that amount of energy is indicated by the symbol E b . Notice that E b is much less than E a . The difference in those two values is the savings in energy provided by using a catalyst in the reaction. Living organisms could not survive without enzymes. During each second in the life of a plant or animal, thousands of different chemical reactions are taking place. Every one of those reactions requires the input of energy, as shown in Figure 1. Every one of those reactions could be made to occur by adding heat, electricity, or some other form of energy—but not within a living organism. Imagine what would happen if the only way we had of digesting starch was to heat it to boiling inside our stomach! Every one of those thousands of chemical reactions taking place inside plants and animals, then, is made possible by some specific enzyme. The presence of the enzyme means that the reaction can occur at some reasonable temperature, such as the temperature of a human body or the cells of a plant. Amino acid: An organic compound that contains two special groups of atoms known as the amino group and the carboxylic acid group. Catalyst: Any chemical compound that speeds up the rate of a chemical reaction. Chemical reaction: Any change in which at least one new substance is formed. Lock-and-key model: One of the ways in which enzymes bring about chemical reactions. Product: A compound that is formed as the result of a chemical reaction. Protein: A complex chemical compound that consists of many amino acids attached to each other which are essential to the structure and functioning of all living cells. Reactant: A compound present at the beginning of a chemical reaction. 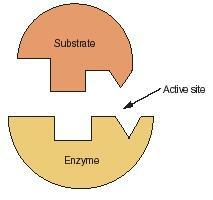 Substrate: The substance on which an enzyme operates in a chemical reaction. All enzymes are proteins. Proteins are complex organic compounds that consist of simpler compounds attached to each other. The simpler compounds of which proteins are made are amino acids. An amino acid gets its name from the fact that it contains two special groups of atoms, an amino (—NH 2 ) group and a carboxylic acid (—COOH) group. Amino acids are of particular importance because they can react with each other to form long chains. If you mix two amino acids with each other under the proper circumstances, the amino group on one amino acid will react with the carboxylic acid group on the second amino acid. If you add a third amino acid to the mixture, its amino or carboxylic acid group will combine with the product formed from the first two amino acids, and so on. A protein, then, is a very long chain of amino acids strung together somewhat like a long piece of woolen thread. Except that proteins are really more complex than that. The long protein does not remain in a neat threadlike shape for long. As soon as it is formed, it begins to twist and turn on itself until it looks more like a tangled mass of wool. It looks something like a skein of woolen thread would look if the family cat had a chance to play with it. A protein molecule, then, has a complicated three-dimensional shape, with nooks and crannies and projections all over its surfaces. You could make your own model of a protein molecule by taking a Slinky™ toy and turning and twisting the coil into an irregular sphere. Enzymes can act as catalysts because of their three-dimensional shapes. Figure 2 shows one way that enzymes act as catalysts. The lower half of the drawing in Figure 2 represents the three-dimensional structure of an enzyme molecule. Notice the two gaps—one with a rectangular shape and one with a triangular shape—in the upper face of the molecule. A molecule with this shape has the ability to combine with other molecules that have a complementary shape. In Figure 2, a second molecule of this kind, labeled "Substrate," is shown. The term substrate is used for molecules that can be broken apart by catalysts. Notice that the shape of the substrate molecule in Figure 2 perfectly matches the shape of the enzyme molecule. The two molecules can fit together exactly, like a key fitting into a lock. Here is how we think many kinds of enzyme-catalyzed reactions take place: a substrate molecule, such as starch, is ready to be broken apart in a living body. The energy needed to break apart the substrate is quite large, larger than is available in the body. The substrate remains in its complete form. An enzyme with the correct molecular shape arrives on the scene and attaches itself to the substrate molecule, as in Figure 2. Chemical bonds form between the substrate and enzyme molecules. These bonds cause bonds within the substrate molecule to become weaker. The bonds may actually break, causing the substrate molecule to fall apart into two parts. After a brief period of time, the bonds between the substrate and the enzyme molecules break. The two pieces move away from each other. By this time, however, the substrate molecule itself has also broken apart. The enzyme has made possible the breakdown of the substrate without the addition of a lot of energy. The products of the reaction are now free to move elsewhere in the organism, while the enzyme is ready to find another substrate molecule of the same kind and repeat the process. I liked it because it was good. I am now just typing words to fill the character length. But yes still good, very good. Useful resource for enzymes. hi i am ketina and i just want to say that that this is my favorite site.It helps me so much in my high school work, i spend all night reading my papers over and over agian going to other dumb sites that make more confused than ever. I wanted to through everything out the window (i didnt so dont worry). Finally i typed in my question that i had and the perfect answer came up. i have never been so happy. i am not a geek and dont like to look school stuff online because it is so boring to hear other peoples smart words i dont understand then i came here and everything made sense. i told my boyfriend and he was intrested and now i think he likes it too. i plan on coming back to look up more things i need to know because you make me smart! whoever you are that made this site ....YOU ARE A AWSOME FREAKING GENUIS!!!!!! How many chemical reactions in enzymes occur in a day? How many times can the enzymes be reused before they break down? What would be the name of an enzyme that broke down sucrose? I'm doing an assignment on enzyme and it is very complex involving lots of labelled diagrams. Can't seem to find out why the substrate start to break in catabolism? and what takes place in anabolism? NEED MORE INFORMATION ABOUT ENZYMES. It IS ALSO GOOD BUT CAN BE EXPLAIN MORE.